You don’t have to kill the porcupine unless you’re going to eat it. If you just want the quills, than you can catch the porcupine while it’s walking and it just shoots its quills into a cloth. Styrofoam is also really good because the quills stick in it. 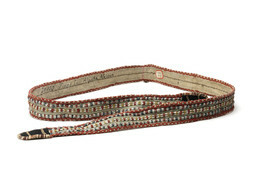 Porcupine quills are stitched to this Tanana caribou skin strap with red and blue embroidery silk or wool. Quills for decorative work were clipped to remove the barbs and left natural in color or dyed using alder bark, berries, or coloring soaked from commercial crepe paper. Judy Woods: This is porcupine quills . . .
Eliza Jones: This is not porcupine quills, this is . . .
Eliza Jones: Embroidery floss . . . this red one. . . It looks to me it looks like different colors of sinew. Kate? Kate Duncan: It looks to me like the red and yellow . . . is thread. And these are quills, very tiny quills. You see right here it looks like quills. Eliza Jones: Where are quills? Eliza Jones: The white, the white. . . . See, this looks like embroidery floss right here, embroidery threads, the edge. . . . Look at this sewing. . . . See how they come up and put these two loops on this way and come back on this side. . . . It crosses over. This yarn does not go through the skin. It’s sewed down with it. It’s sewed down with like a linen thread or something. . . . Mom used to use lot of that . . . embroider on moose skin. . . . You know what I really admire is that this red thread does not go through, it’s tacked on. It’s like the way you do beadwork. . . . These stitches are so uniform. Eliza Jones: On this one it says “Tanana River.” But on the other hand, it says “Hän.” And Hän is in the Eagle area. Trimble Gilbert: Hän? That’s Eagle, Hän. Eliza Jones: So maybe this came from the Hän. . . . It’s a strap it says. So would you call that łeł [belt] if it’s a strap? Eliza Jones: What’s another word for belt, łeł? Trimble Gilbert: Thah [belt], thah. Eliza Jones: What’s your word for belt? Judy Woods: We say łeł [belt]. Phillip Arrow: It’s different. Long ago they use vaxa xandritidlchidh [belt]. Long words on that. Kate Duncan: I was just going to check the other end. There doesn’t seem to be any evidence of how it connected to anything that I see. . . .
Eliza Jones: I don’t know what it would have been used for. Maybe it was just a decorative thing? It must have had some practical use. Kate Duncan: It looks too big to go around the waist, doesn’t it? Judy Woods: It’s too narrow. Eliza Jones: Yes, too narrow. . . . See this. Same thing on this end. It has a hole on there. So I don’t know what it would have been used for. . . .
Kate Duncan: Would they ever have had it that long to wear around the waist and sort of just looped over? Eliza Jones: No, it’s not. I think it’s something you wear, maybe drape around your neck. . . . I think it’s something you need to talk to an elder from the Hän area. Aron Crowell: I think we’ll talk a little bit more about this belt, 201100. We looked at it yesterday, but we wanted to have a chance to look at it with the magnifying glass. . . . Did it look like quills? Eliza Jones: The white ones are quills, and the red ones look like silk threads. Aron Crowell: What’s the process for working with quills. Starting with a porcupine, how do you prepare them and use them in sewing? Judy Woods: You cut the tip off, the point. And you sew it and you sew. . . . My mom used to work with quills. Suzi Jones: With a cloth or something? Eliza Jones: Yes, with a cloth. Styrofoam works really good because it just sticks. Aron Crowell: Can you dye them? Aron Crowell: How do you do that? Judy Woods: My mom used to use crepe paper. A long time ago, crepe paper. They don’t have those things anymore. They put that red one in the water, and then she put them in and see the dye. Eliza Jones: If you use kk’es, which is alder, you peel the bark off and then you cut them up in to pieces and you put them in water, and leave them in the water . . . cold water. . . . I don’t really work with quills. I do more sewing. But I know people who used to pick berries and use berries to dye them also. . . . I guess that after the introduction of beads, people kind of stopped using quills for a while, because the beads were more sturdy and they were more durable I guess than quills. But now I see the art is coming back.